Avocado (Hass) is a pear shaped fruit with a tumbled leathery thick skin, a pale lime green flesh, and a central pit. 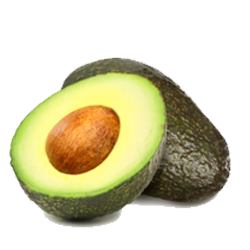 Hass avocado’s have a creamy and smooth texture with a nutty sweet finish. Avocado’s are rich in dietary fibre, several B vitamins, vitamin C, E, and potassium. Avocados have a higher fat content than most other fruit, mostly mono-unsaturated fat and is an important food in the diet of those who have limited access to other fatty food. A ripe, ready to eat avocado is slightly soft and should have no sunken spots or cracks. Avocado’s should not be refrigerated until ripe. Once ripe, they can be stored in the refrigerated for up to 4 days. The flesh is prone to browning after exposure to air. To prevent this, you can add lemon or lime juice to the avocado after peeling. Avocado’s are delicious in salads, soups, sandwiches, and scrambled eggs. They are the key ingredient in some sushi and the base for the Mexican dip guacamole.